Thanks to those blackwood sawmillers who contacted me in response to my recent blog. Here are some of the things I learned from these discussions – some very good, some not so good. Firstly there is strong demand for blackwood from export markets. Local domestic markets remain generally quite. Blackwood growers wanting to get a good price need to search out those few processors who are accessing these markets. Prices “on stump” of up to $500 per cubic metre for good quality plain-grain logs are being offered, with exceptional logs going well above this. Access to these export markets is available from anywhere in the State. One processor is currently shipping an average one container of logs a day and is looking to increase this dramatically next year. They are accessing markets in 7 different countries! Will Tasmanian farmers be able to meet this demand? Strong demand for quality appearance-grade wood and a falling Aussie dollar are helping to drive interest in the blackwood market. At these prices a blackwood plantation at harvest would be valued at well over $100,000 per hectare! Anyone interested? Do I have a problem with exporting blackwood logs? Not at all! Farmers should have the option to access whatever markets they wish for their products. If local processors can’t offer a good price then export it is. As I often remind people, forestry is business. Growing trees for wood production is about profit and good forest/land management. The absolute foundation of any successful forest industry must be profitable tree growing. Not community service! Not taxpayer subsidises! Not ideology! But the blackwood marketplace is not functioning anywhere near as well as it could/should. All of this commercial activity is happening “off the radar”. Instead of building interest in the farming community, creating much-needed positive sentiment in the forest industry, and building support and interest from the wider Tasmanian community the blackwood marketplace is still pretty invisible. With so many processors (at least 21) in the private blackwood business in Tasmania it is a very competitive, and at times cut-throat business. Hence the industry is dominated by fear and mistrust. Because of this fear all business is done quietly by word-of-mouth. No advertising. No promotion. No marketing. Because of the fear and mistrust within the industry Tasmania remains ignorant of what is happening in the blackwood market. Farmers are generally unaware of the current and future potential of growing and selling commercial blackwood. A lost opportunity for Tasmania. The blackwood industry will only grow and prosper if there is greater transparency and integrity. The market clearly wants quality blackwood timber and is prepared to pay good prices. The forest industry in Tasmania is dominated and controlled by a select few sawmillers and processors. Private forest growers essentially have no voice or power/influence in the industry. Any forest industry that is dominated by the processors is doomed to fail. Forestry is fundamentally about making profits by growing trees. If tree growers have no power or voice in the game then no one will grow trees. It’s that simple. There was plenty of criticism in the discussions with processors, about State forest policy and Forestry Tasmania. It is a myth that the Tasmanian forest industry is united and speaks with one voice. We generally only hear one voice because the dissenters fear the consequences of speaking out. The forest industry can be a rough trade at times. These processors who deal with private forest growers know very well the damage that past and current State forest policy and practice is having on the industry. The discussions with blackwood processors gave me a great sense of hope. But there are still plenty of challenges ahead. 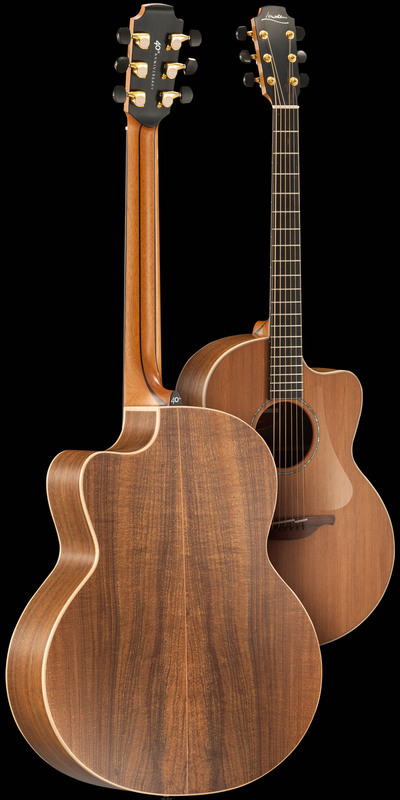 The market clearly wants more Tasmanian blackwood. The industry is currently too crowded and cut-throat. It needs 2-3 processor/operators that are prepared to cut through the mistrust with openness and integrity, and an efficient low-cost business model that delivers what the market wants whilst building trust and good relationships with the farming community. With so much negative sentiment and bad experiences it will take a lot of work to rebuild trust within the farming community. Keeping “off the radar” is not the way to rebuild trust and interest. Most farmers will respond positively to a professional, honest, transparent approach. But good long-term relationships take time to develop. Getting farmers to make a 30+ year investment by planting blackwood will require as much positive support and encouragement as possible. We need lots of flag waving and trumpet blowing on a major scale. And plenty of market “pull”. Just so I don’t have to repeat this experience in 12 months time here’s some guidance for the FT Annual Report editors. It’s pretty basic stuff really, instead of the mealy-mouth rubbish we normally get in the annual reports. I also highly recommend reading John Lawrence’s review of the financial management and performance of FT from their 2014 Annual Report. It makes for pretty depressing reading especially when you think about all the political games being played around forestry. The forest industry in Tasmania hasn’t got a future whilst this madness continues. Hopefully my next story will be a good news story. Cartoonist Jon Kudelka has identified a new version of Brand Tasmania. One that we can all identify with. The one element missing in the above image (in addition to the crumbling roads) is the queue of sacked Tasmanian teachers and nurses outside the local Centrelink office. Please take note Forest Stewardship Council! Good commercial management and performance is absolutely fundamental to good forest management; especially when the forest in question is publically owned! As a stakeholder in the special timbers industry attempting to build a profitable blackwood growers industry based on Tasmanian farmers, it is difficult to read the latest Forestry Tasmania annual report and get any satisfaction. In fact the overwhelming response is frustration, anger and astonishment. We have been told repeated over the past few years, both in the media and in State Parliament that the special timbers industry is in crisis. Even to the point of having to start logging our reserves and conservation areas to keep the industry going a while longer. This looming crisis has been obvious to me for many years as the industry has survived on the residues of old growth industrial forestry. So here we have an Annual Report that reads like nothing is wrong. The Special Timbers section (pages 25-26) contains such superficial information as to be worthless. So is there in fact a crisis in the special timbers industry? Not according to the Annual Report. New State legislation just requires a review of “our supply strategy in future years”. A resource review is currently underway, but no mention of when this will be completed. The new 2013 blackwood sawlog resource review is mentioned, but there is absolutely no discussion about its impact on the current or future supply of blackwood from our public forest resource, despite a significant drop in the estimated sawlog sustainable yield. Never mind that the planned harvest of blackwood sawlog will continue at well above the sustainable yield. What about the proposed logging of special timbers in our parks and reserves? Absolutely no mention of it. What about a strategy for the future that might actually be useful and meaningful. Again no mention of the future of the special timbers industry in the Annual Report. So when the discussion of special timbers in the Annual Report finishes with the off-hand mention of the tender sale price for a single blackheart sassafras log I feel absolutely insulted and ripped off. As if the sales price of sassafras sawlogs has any market significance. No one is going to invest in growing sassafras; it takes too long to grow. As if Forestry Tasmania gives a “flying fig” about sawlog prices anyway! Forestry Tasmania is a complete basket case aided and abetted by scheming politicians. 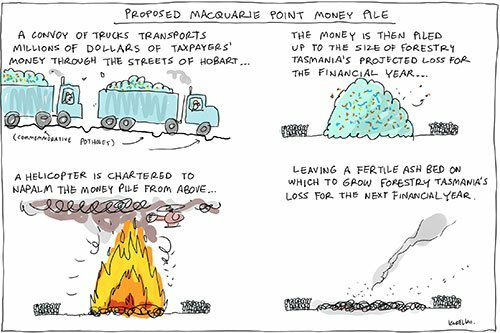 As Mr. Kudelka clearly illustrates with his cartoon, the folly around State forest policy and practice continues unabated, and the burning of precious taxpayers money will likely continue for many years to come. And the potential to develop and expand a profitable private blackwood industry remains frustrated.